Kärcher is a name familiar to many households or garden owners, and its distinctive yellow and black logo is synonymous with cleaning systems around the world. Since 1950 when Alfred Kärcher invented the first high-pressure cleaner in Europe, the Winnenden-headquartered family business has expanded beyond its German roots and today boasts offices in almost 70 countries. High-pressure cleaners, vacuum and steam cleaners, vacuum sweepers and scrubber driers, gantry car washes, drinking water and wastewater treatment systems, water dispensers, a telematics-based fleet management system as well as pumps and watering systems for home and garden, make up the company’s vast portfolio. According to Kärcher, innovation is the most important factor in ensuring company growth. Looking at its 2017 figures, approximately 90% of all products in the Kärcher portfolio are five years old or less. With this level of optimisation and innovation comes a need for fast, efficient and tailored processes, from the design stage through to the final product shipment. Kärcher’s secret to keeping up with ever-increasing production demands, while constantly driving innovation across its products, is attributable in no small measure to its use of Stratasys 3D printing technology. A veteran when it comes to using 3D printing, Kärcher has been working with the technology for 20 years – during which time the company has brought 3D printing in-house to optimise its production workflow. 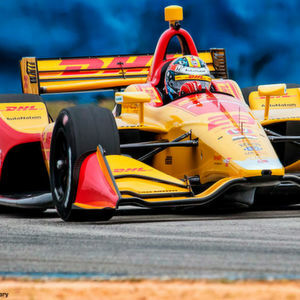 Using both Stratasys FDM and Polyjet technologies, Kärcher has understood the power of 3D printing in accelerating a product’s time-to-market. 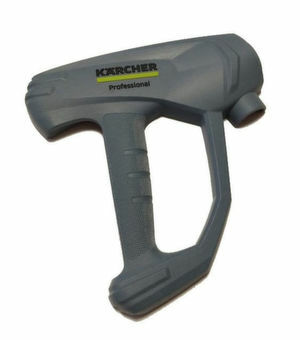 Kärcher’s recent product development is a prime example of optimizing a design to offer customers the best possible product. 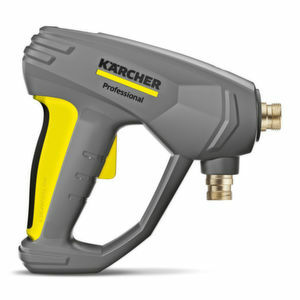 The Easy Force trigger gun is the heart of the latest Kärcher high-pressure cleaner and operates with a unique technology. Its patented design incorporates several different materials with varying rigidity and complex geometries. This combination makes realistic prototyping difficult with traditional manufacturing methods. “Traditionally we would use milling or order individual standard parts to assemble prototypes for products,” explains Achim Sanzenbacher, Manager Prototyping at Kärcher. “This not only took a long time, but it also constrained our ability to create a true-to-life prototype with the look and feel of the final product. Stratasys Polyjet 3D printing with its rubber-like Agilus material and colourful, smooth Vero material has enabled us to create prototypes that mimic the final part in no time at all, speeding up our prototype development for the Easy Force trigger gun significantly. The Polyjet-based Stratasys J750, the world’s only full colour, multi-material 3D printer, enables over 500,000 colours and textures, and up to 6 material combinations in one print – ideal for ensuring high accuracy of soft and hard material parts needed for the Easy Force trigger gun. With Stratasys PolyJet technology, Kärcher is able to 3D print several different parts on one print tray. This allows the design team to test different variations of the same product in one go, which makes assessment of the best design option more efficient and speeds up the creation of the final prototype. alphacam, one of Stratasys biggest resellers based in Schorndorf, Germany, has accompanied Kärcher since the installation of its first FDM machine, over 20 years ago.